A 2D Sandbox created with you in mind. Infused with RPG elements, Crea focuses on exploration and creation. Modding fully supported. 1,096 backers pledged $27,870 to help bring this project to life. Join our finale livestream today at 3PM (PST)! First look at the music in Crea! ACHIEVED! - We will add mounts into Crea - creatures (and maybe machines) that your characters will be able to ride on. We will come up with a few ideas for mounts and then let you guys vote on them! Feel free to make suggestions. $25,000 - We will add a second playable race to Crea. We’re not yet sure what kind of race this will be, but we’ll be working on posting some concept art, and we’re open to suggestions as well. Crea is an easily moddable, 2D sandbox game with a lighthearted mood, colorful art and RPG elements. 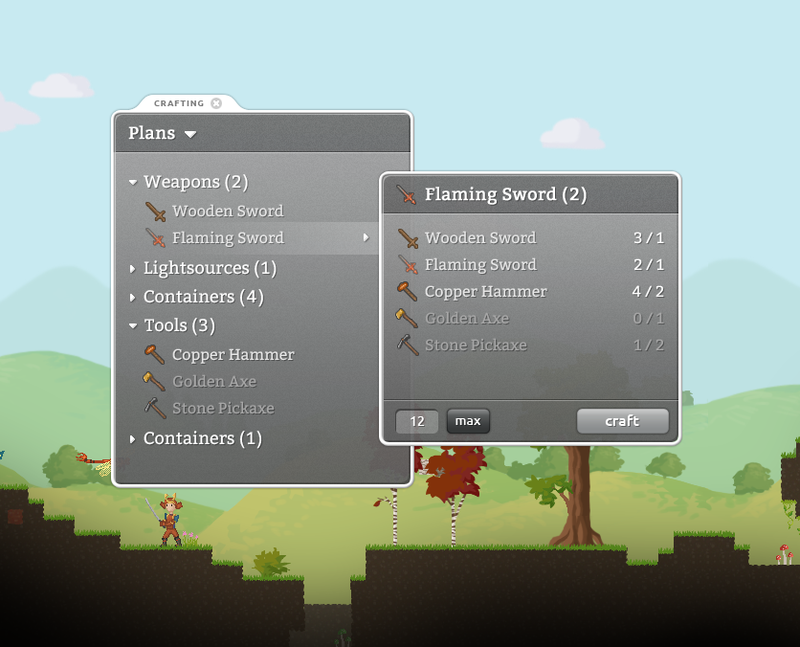 Drawing on the pioneers of the sandbox genre such as Minecraft and Terraria, Crea features combat and crafting in attractive, randomly-generated worlds for you to explore, tear apart and build back up in your own design. What sets Crea apart from the others is that it's created with you in mind. Our goal is to develop a game that fully realizes the potential of the community and mods. Every aspect of Crea is designed to be easy to modify and customize. It's simple to modify characters, weapons, monsters, items, biomes, or to even create new playable races! If you can imagine it, it belongs in the world of Crea! In many sandbox games, mod support seems like an afterthought or a hastily designed add-on. Considering the limitless potential for fun and creativity in the world of player-designed mods, we think this is really a shame. In Crea, modding support has been a primary consideration of every development decision. We believe anyone should be able to mod Crea, so we’ve made it easy enough for beginners but flexible enough for more advanced mods. Creating new content is as simple as copying an existing content file and changing a few lines of text! We will be providing “how to” guides and other documentation to help get you started. To give us this modding flexibility, the game's content scripts are Python code, which is a scripting language that can handle real game logic. We've exposed the entire game engine to Python, which means that new content can make meaningful and unique changes to gameplay. The base game content is also a mod itself, so it is fully accessible to anyone who wants to view and modify it. Our ultimate goal is to make Crea available through Steam and take full advantage of their new Steam Workshop. With the workshop you can easily share, find, rate and download mods with the entire Steam community. Figuratively speaking, Steam Workshop was made for a game like Crea. Commission an original soundtrack from the talented Robot Science. We are big fans of his work and are super excited to have the chance to work with him. You can check out his work at his website. The background music on our video is also by Robot Science. Commission sound effects, possibly also from Robot Science, but this is TBD. Purchase development hardware, such as a Mac computer. Any funds raised beyond our goal will be used to complete Crea faster. If you’re new to Kickstarter, this system works on an all-or-nothing model. When you pledge money to our campaign, it’s held in escrow for you by Amazon. If we reach our funding goal by our deadline, we receive that money. If we don’t, your money is returned to you. This way you can rest assured that we will only receive funding if there's enough for us to complete our project. Our goal is to make Crea available through Steam. You can help our chances of being accepted by Steam by contributing to our Kickstarter campaign, so that we can show that Crea has a solid fanbase. Siege Games is a small group of indie game enthusiasts based in the San Francisco Bay Area, a ragtag coalition of professional programmers and one graduate student. Since we all work or study full time, Crea is being created in our spare time, fueled by our passion for indie games. For a regularly updated and in-depth timeline you can check out our project plan. For a quick overview just look below. We want to make this game happen, and we hope you do too. Thanks! Everyone that backs the project will get the wallpaper. $1000 Reward will receive 15 digital copies of Crea. Exclusive Crea wallpaper, featuring our famous corrupted llama! Digital copy of the game on all launch platforms (Windows, Mac and Linux). EARLY BIRD SPECIAL! Digital copy of the game on all launch platforms, digital copy of the soundtrack, and beta access. Digital copy of the game on all launch platforms, digital copy of the soundtrack, and beta access. 4 Digital copies of the game on all launch platforms. Digital copy of the game on all launch platforms, digital copy of the soundtrack, and EARLY beta access. Digital copy of the game on all launch platforms, digital copy of the soundtrack, beta access, and we'll name an NPC after you! Digital copy of the game on all launch platforms, digital copy of the soundtrack, EARLY beta access. We will create a Crea-style avatar in your likeness and print your character on a postcard, sign it and mail it to you. Also your name and custom avatar will be in the game credits. Digital copy of the game on all launch platforms, digital copy of the soundtrack, EARLY beta access and we’ll create a playable character in your likeness! Also we will print your character on a postcard, sign it and mail it to you. Digital copy of the game on all launch platforms, original game soundtrack, EARLY beta access, and we'll create an in-game item, weapon or armor according to your description that could be included in the final game.